A new year means a new beginning and I'm excited to get back into the Sunday Supper Movement events that are hosted every Sunday by various taste-makers around the web. This week the group is featuring lean beef recipes. Beef often gets a bad reputation as an unhealthy food, but lean beef can make for some healthy and delicious recipes. Growing up in Philadelphia, I'm no stranger to the Philly cheesesteak and though I don't eat them often I do enjoy the taste every now and again. 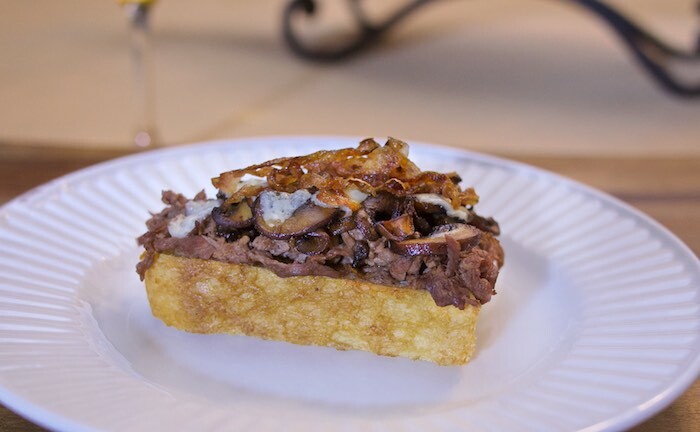 Not being able to find the perfect roll to host this particular sandwich is the reason I came up with serving the thin beef smothered in caramelized onions bruschetta style. Heat oil in a large skillet, over medium-high heat. Add onions and cook, stirring frequently, until softened and browned in spots, about 8-10 minutes. Season to taste with salt and pepper. Top bread with steak and sprinkle with provolone cheese. Put in a toaster oven or broiler just long enough that the cheese begins to melt. Remove top with onions and serve. That looks so good and is a great idea! Oh, boy, this topping sounds incredible!!! YUM! Love cheesesteak sandwiches and this bruschetta version is amazing.